BollyNewZ.com » Oops! Ajay smoked in public again! 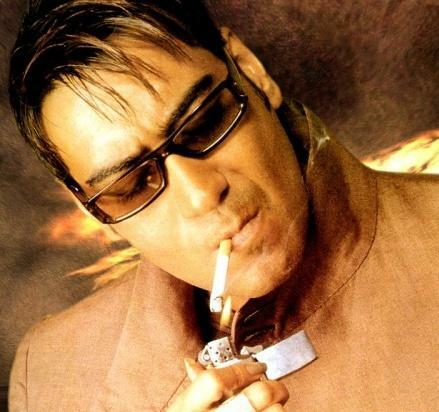 Ajay Devgan has taken a second round of trouble because of his smoking act. Ajay has been trapped earlier into the nets of the watchdogs against smoking. He had already been fined once in Chandigarh on account of public smoking but we guess he’s not heard of the phrase “once bitten twice shy.” He was again found smoking in public in Goa on the sets of Golmaal 3. Celebs have known to be major influences on the public and therefore are expected to be extra careful especially when it comes to smoking. A complaint has been registered to the State Tobacco Control Cell and the Union Ministry of Health and Family Welfare to penalize the actor with more severe punishment as the first warning and penalty seems to have gone futile. This is not the first time a celebrity has been caught blowing smokes into the air. Earlier Shahrukh Khan and Amitabh Bachchan have also been dragged into legal hassles on account of directly or indirectly promoting smoking. Other actors like Tusshar Kapoor and Arshad Warsi also had to bear the brunt of smoking while on a film shoot in Margao. It has also been recommended that habitual violators should be put behind bars. National Organisation for Tobacco Eradication (NOTE) general secretary Shekhar Salkar has also recommended that the first installment should be charged Rs.500, the second being Rs.5000 and the third offense being a 6 month imprisonment along with Rs. 5000 as a fine. This kind of an offense which sadly the celebs don’t even consider as an offense is getting very casual for them. In order to stop this, recommendations need to be followed so that the film industry learns the lesson and does not carry on with such immature behavior.